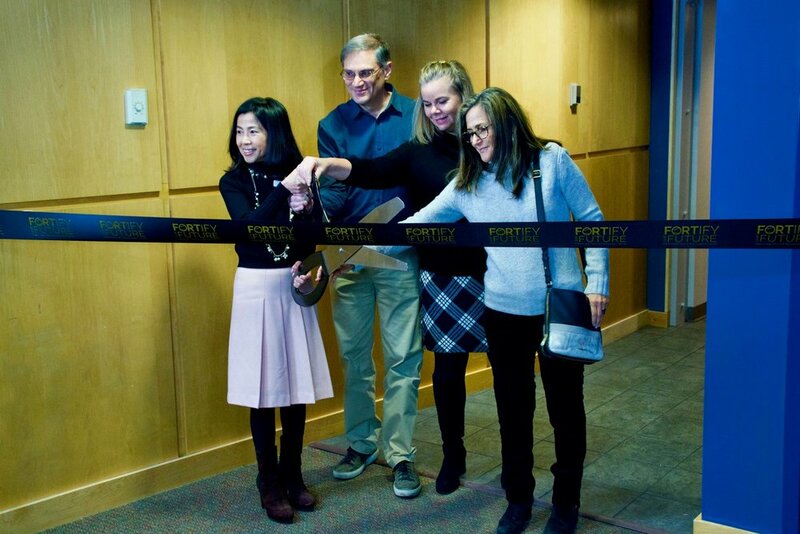 Executive Director Esther Tsai, Capital Campaign co-chairs Rick Rinkoff and Michele Mingo and Fred Wells’ daughter Wendy Wells handled the ribbon cutting honors. The Fort celebrated the completion of Phase I for its $1.7 million Capital Campaign with a ribbon cutting ceremony January 18, opening the new walkway between the front and back domes. Many patrons and contributors were there for the event including lead donors Rick Rinkoff, Michele Mingo and Wendy Wells, daughter of founder Fred Wells, representing the Wells Family Fund of the Minneapolis Foundation. USTA Northern’s Becky Cantellano also presented Executive Director Esther Tsai with a check for $12,500 for the Capital Campaign. “This milestone marks the overall growth and achievements of The Fort the past 18 years," Tsai said. "We are very grateful to all of our patrons and the tennis community for their many years of support, as well as offer our heartfelt gratitude to the Wells family for trusting us with Fred Wells' legacy. All of these improvements are necessary to renew our partnership with the Minneapolis Park & Recreation Board and to facilitate program growth." The “FORTify Our Future” Capital Campaign is financing required capital improvements needed for The Fort to renew its lease with the City of Minneapolis, including replacing its two tennis domes, resurfacing and adding a ninth court, installing air conditioning and new lighting in both domes, expanding the parking facilities and constructing a new walkway and entry point between the front and back domes. In December, the Fred Wells Tennis & Education Center kicked off its campaign to the public with a $50,000 matching gift courtesy of the Wells Family Fund of the Minneapolis Foundation, raising over $130,000. Almost $600,000 has been collected for the project thus far. 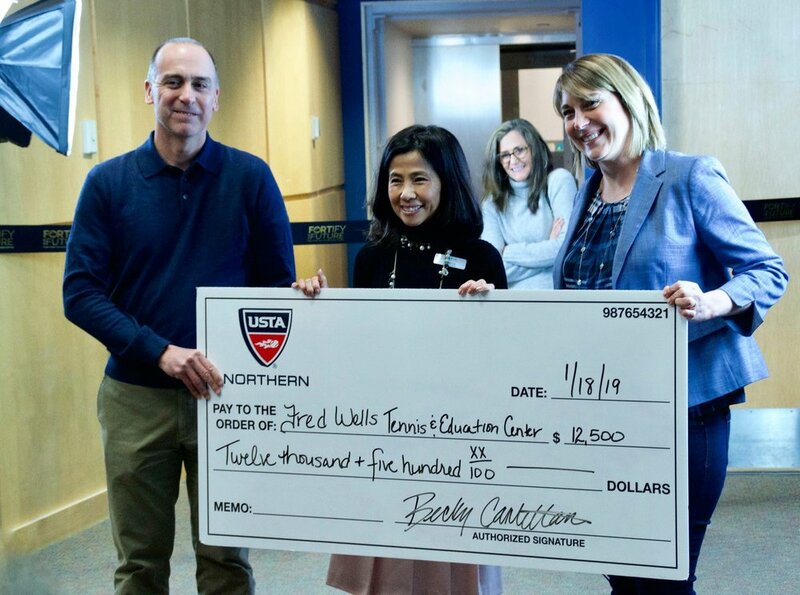 Esther Tsai accepts a check for $12,500 from USTA Northern’s John Chandler and Becky Cantellano for the Capital Campaign. “This is a great beginning to the Capital Campaign,” Mingo said. “I cannot wait for all the improvements to be completed." For more information about the Fred Wells Tennis & Education Center’s “FORTify Our Future” Capital Campaign, including renderings of the front dome, or to make a donation, please visit www.fwtec.org/capital-campaign or contact Lisa Mushett at lisa@fwtec.org or at (612) 804-4008.